If you are a serious scrapbooker or enjoy making cards you really should have some kind of die cut machine in your tool chest. The Cuttlebug is an excellent choice. The cost is about 70-80.00 US. It is easy to use and works with pretty much any brand of dies and embossing folders. It is the perfect size for card makers and scrapbook enthusiasts. If you have a choice on which die cut machine to buy this is the one I would recommend. Probably the most popular portable/ personal die cut machine is the Cuttlebug from Provocraft. ( They also make Cricut machines). 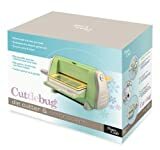 The reason the Cuttlebug cutter is so popular is it is the only machine that will cut ALL dies from all other die cut companies. So the Cuttlebug will cut Spellbinders dies, Quickutz dies, Sizzix , BigKick and others. The CuttleBug will also emboss- you can make some great backgrounds for your cards using embossing folders that are pretty inexpensive, around 4.00. My favourite tio use is Swiss Dots, and then to cut out a shape with a die cut. Again, Cuttlebug will work with other brands of embossing folders. The Cuttlebug is quite easy to use and requires very little “strength” to rotate arm that pushes paper though machine. My daughter does it easily. Cuts Dies Cuts using plates and dies system. It will also emboss paper. What Brands of Dies Will Cuttlebug Work With? The prices will varfy depending n the season. Right nw the best price I can find for a Cuttlebug is at Creative Xpress. They are selling for 49,99 and come with small die kit- a die and 4 small embossing folders. If yur Micheal’s will allow y0u- also try using a 50% 0ff coupon. Some Michaels baclk at letting you use the coupon on Cuttlebug thinking it is a Cricut product.